TUESDAY, Feb. 6, 2018 (HealthDay News) -- Fewer U.S. children are having to deal with asthma attacks in recent years, federal health officials reported Tuesday. That also translates into fewer missed school days and hospital visits, the researchers noted. In fact, the number of kids with asthma who had one or more asthma attacks in the past year dropped from nearly 62 percent in 2001 to about 54 percent in 2016, according to a new report from the U.S. Centers for Disease Control and Prevention. However, "not all the news is good," the CDC's acting director, Dr. Anne Schuchat, said during a midday news briefing on the report. About half of all children with asthma had at least one attack in 2016, the researchers found. "Today's report reveals that, in 2016, one in six children with asthma still ended up in the emergency department or urgent care," Schuchat said. "Severe asthma attacks can be terrifying for children and for their families." Moreover, the recent decline in asthma began after a steady increase, Schuchat said. The prevalence of asthma in children grew between 2001 and 2010, she said, but fell from 2010 to 2016. The decline in asthma attacks was seen in boys and girls and across all ages and ethnic groups, Schuchat said. And, although the decline signifies a step in the right direction, she said, more work is needed. "We are all focused on flu right now," Schuchat said. "But I want to remind you that flu can be very hard on people with asthma. In fact, of the children who have been hospitalized for influenza so far this season, asthma has been the most common medical condition we've seen." Asthma affects about 6 million kids, making it the most common respiratory disease among American children. Although no cure for asthma exists, the symptoms usually can be controlled. Asthma sufferers can prevent flare-ups by avoiding dust, pet dander, tobacco smoke and other irritants that can trigger an attack. In addition, medications -- such as inhaled steroids -- can prevent most asthma attacks. But many kids don't use their medicine, Schuchat said. "We know that children need to use medicine as prescribed to prevent asthma attacks, but our data show that about half of children prescribed asthma control medicine do not use them regularly," she said. Asthma is most common in children 5 to 17 years old, boys especially. It's also more common among black and Puerto Rican kids, and children from poor families. In 2016, children 4 years old and younger were those most at risk for asthma attacks, according to the new report. Hospitalizations for children with asthma fell from nearly 10 percent in 2003 to about 5 percent in 2013. The number of children who missed school because of asthma was lower in 2013 than in 2003. More kids with asthma are learning the signs and symptoms of an asthma flare-up and what to do if they have one. One in six children with asthma end up in the emergency room, and one in 20 are hospitalized for asthma each year. "There is no single strategy or magic bullet that prevents asthma attacks, but recent evidence shows that a combination of actions can be highly effective," Schuchat said. 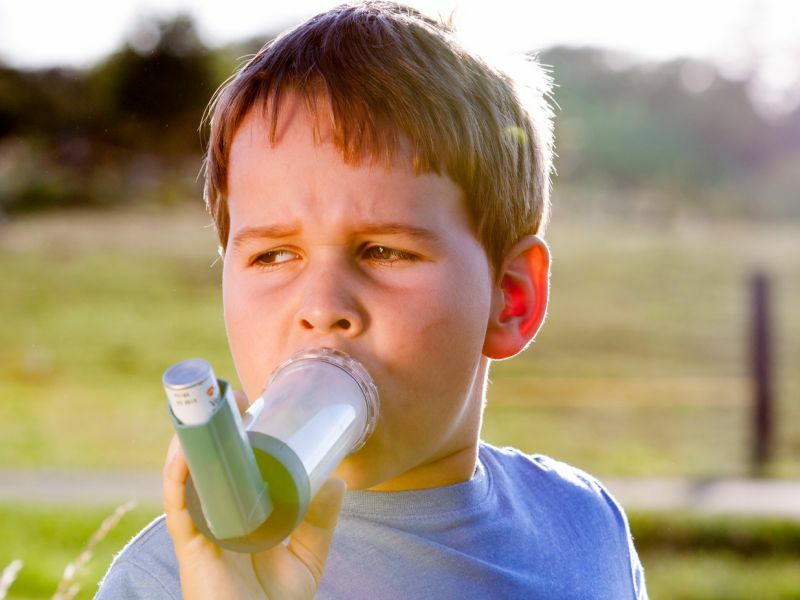 Strategies to help reduce asthma attacks include having asthma action plans, and teaching parents and children how to manage asthma with control and rescue medicine, according to the report. Avoiding triggers -- such as tobacco smoke, mold, pet dander and air pollution -- also is important, the researchers noted. Schuchat said she believes that the decline in asthma attacks is due at least in part to better-educated kids and parents, and to community efforts that focus on high-risk children. The CDC report was based on data from the National Health Interview Survey from 2001 to 2016. The report was published Tuesday in the CDC's Vital Signs: Asthma in Children -- United States, 2001-2016. What is asthma? Learn about asthma, a chronic inflammation disorder of the bronchiole tubes. Discover information about asthma attacks, asthma symptoms, and asthma treatments.